Poussin, Claude, and French Drawing in the Classical Age, a new exhibition opening at the Morgan Library & Museum on June 16, explores the work of some of the most celebrated artists of the time. 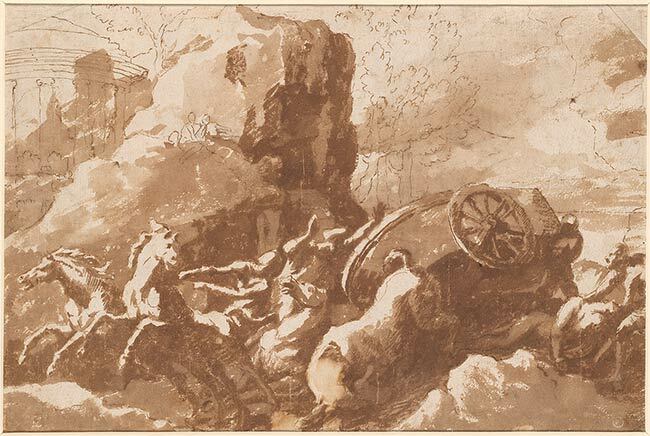 More than fifty drawings largely from the Morgan’s collections — including works by Claude Lorrain, Nicolas Poussin, Jacques Callot, and Charles Le Brun — will be on view. Together they demonstrate the era's distinctive approach to composition and subject matter, informed by principles of rationalism, respect for the art of classical antiquity, and by a belief in a natural world governed by divine order. The exhibition runs through October 15. "The Grand Siècle saw artistic development unlike any before it in France," said Colin B. Bailey, director of the Morgan Library & Museum. "The visual arts, literature, music, drama, and architecture all prospered. Poussin, Claude, and French Drawing in the Classical Age explore the extraordinary advances in the field of drawing by some of the true masters of the period, advances that provided the foundation for all French art that followed." The Renaissance style in France resulted from a combination of native artistic talent and artists and styles imported from the Italian courts. With the return of French artists trained in Italy, Paris became a locus for artistic activity by the 1630s. The generation of artists working there, Simon Vouet (1590–1649) foremost among them, ushered in a new era for French art. Having established a successful career in Rome, Vouet was recalled to Paris by Louis XIII in 1627 and named first painter to the king, who also engaged him to be his drawing tutor. Vouet and the king developed an intimate relationship, as Portrait of Louis XIII (ca. 1632–35), an informal, frankly executed sheet indicates. Although few drawings from Vouet's Italian period survive, this portrait of the king made not long after the artist's return to France reveals the naturalism he learned in Italy and heralds the impact that style would have on French art more generally. The printmaker Jacques Callot (1592–1635) spent most of his career at Cosimo de' Medici's court in Florence before returning to France in 1621 to work at the court at Nancy. The Miracle of St. Mansuetus (ca. 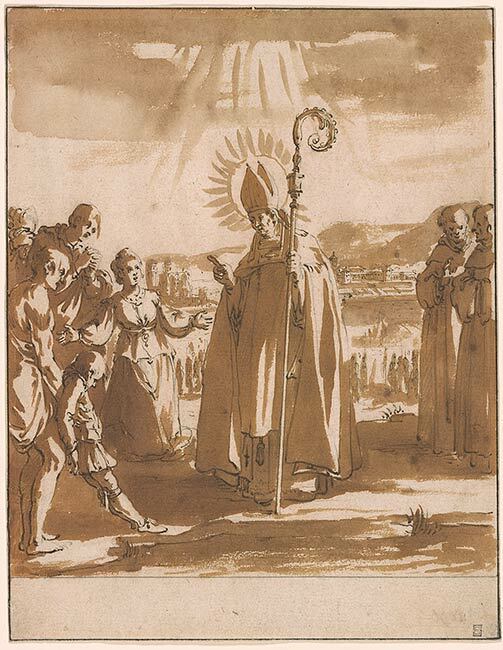 1621), produced after the artist's return, is devoted to a local saint, Mansuetus (d. 375), who was the first Bishop of Toul, in Lorraine (where Callot was born). It shows the saint resuscitating King Leucorus’ son, who had drowned in the river Meuse, and is one of a series of exploratory studies on the theme in preparation for the artist’s 1621 etching. Right: Jacques Callot (1592 —1635), The Miracle of St. Mansuetus, ca. 1621, pen and brown ink and brown wash, over black chalk. The Morgan Library & Museum; Purchased as the gift of Mrs. Kenneth A. Spencer II. Courts were centers where philosophy, music, literature, and the fine arts flourished under the patronage of the royal family and wealthy nobles. The drawn portrait was a particularly vibrant tradition of the French court, beginning in the Renaissance and extending through the seventeenth century. These works were collected, assembled into albums, and exchanged as gifts. Portraiture was popular at the courts of Louis XIII and Louis XIV, and many members of the court are recognizable even today through their drawn and printed likenesses. Such depictions reached their apogee in the hands of masters such as Daniel Dumonstier (1574–1646), who was renowned for entertaining his sitters and producing flattering colored chalk portraits. Portrait of a Gentleman of the French Court (1628) is carefully annotated by the artist with the exact date, August 31. However, Dumonstier did not identify the sitter. A possibly contemporary inscription suggests that it depicts a M. de Porchere, but there were at least two poets active at the court with the surname Porchere. It is Dumonstier’s facility with combining colored chalks for a meticulous, lifelike effect in such large scale sheets that sets him apart as a portraitist. III. Hopper Drawing at the Whitney Museum of American Art: "It took me ten years to get over Europe"